Inspired by the modernist architecture of Neskirkja and by the breadth of its new organ's musical possibilities, this recording contains many threads of connection within and between the chosen works. 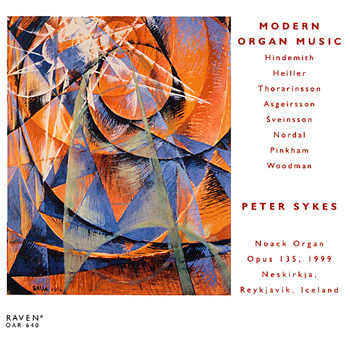 The idea began with a specific request from Neskirkja's organist, Reynir J—nasson, to include some Icelandic organ music; upon learning some of these distinguished pieces, it became clear to me that clear musical affinities could well be reflected in the inclusion of works by Hindemith and Heiller. The remaining works of the recording reflect contemporary composing activity from the region where this organ was built (Boston) and where it now resides (Reykjavik) from organist/composers of three generations, bridging worlds that have in the end more similarities than differences. Paul Hindemith's musical language is uniquely suited to the organ. Although the total number of works is small, they have earned a permanent place in the repertoire (Daniel Pinkham said to me, as I discussed this program with him, "Those works have stood up so well, haven't they") and have served as inspiration to a generation of younger composers. Their gratefulness for the medium may seem facile at first, but this is serious music indeed, with heartfelt statement at the core. Sonate I, dating from 1937, combines an objective tonal language with a broad sweep of styles and colors; the Phantaisie is Regeresque in its impassioned outbursts, while the solemn dance of the closing movement is enlivened by a jolly, whistled tune. Hindemith specified dynamic and pitch levels, but not tone colors (much less specific stops) for registration; this performance offers one solution inspired by an orchestral outlook as well as the musical and registrational possibilities of this organ. Anton Heiller's place in organ history of the twentieth century is likewise assured, but his memorable performances and many recordings (especially of the works of Bach) and his visionary teaching legacy have perhaps overshadowed his compositions, which are worthy of study in their subtlety and complexity. The suite In Festo Corporis Christi is inscribed "Marie Claire Alain in herzlicher Verbundenheit gewidmet" and dated S.D.G. (Soli Deo Gloria) 27 December 1959. In the four brief movements, the chant tunes (I: Cibavit eos; II: Sacerdotes Dominum; III: Quotres cumque; IV: Lauda Sion) are colorfully decorated and polytonally harmonized as well as used in canon and motivic imitation. Clearly intended for a modern tracker organ and with registrations specifically noted (and followed as much as possible here), this work reflects the energy and enthusiasm of the organ reform movement at its best. Jon Thorarinsson studied with Paul Hindemith at Yale University, and the musical influence of Hindemith in Praeludium, Choral und Fuge über ein altes Thema is not difficult to recognize. The form of this attractive piece, written in 1954, resembles Hindemith's organ sonatas; in three movements, it is an extended chorale setting of "an old theme" much in the manner of Hindemith's third sonata, although in this case the same tune is used for all movements. The first movement sets the tune in long notes in the bass, the second in the soprano, and the third in the tenor amidst fugal episodes reminiscent of the last movement of Hindemith's second organ sonata. The piece is dedicated to Dr. Pall Isolfsson (1893-1974), Icelandic organist, titulaire of the Hallgrimskirkja in Reykjavik and director of the Reykjavik Conservatory. Jon Asgeirsson wrote the Passacaglia i g moll in 1956 while studying at the Royal Scottish Academy of Music. The basis for the passacaglia theme is the famous "Dido's Lament" (When I am lain in earth) of Purcell; nineteen variations are presented, including a fugue in which the theme is transposed into differing keys and voices. The expressive tonal language of the piece bridges the late nineteenth century into the twentieth, while the figural writing honors the long tradition of organ passacaglias throughout history. The next two pieces come from a collection of organ music by Icelandic composers published in 1980. Jon Nordal's A Prelude on a Hymn that was never sung is a truly modern conceptual piece; in three sections, its improvisatory feeling and free atonality places it firmly in the second half of the twentieth century.Gunnar Reynir Sveinsson's Jesus, my morning star is a choral fantasy rather than a choral prelude; the tune is used as a motivic basis for imitation, stretto, fugue and canon. The haunting refrain's rhythm is particularly evocative. Daniel Pinkham writes of Four Epigrams, "Today, the term "Epigram" is generally used as a literary term to refer to a short poem treating concisely and pointedly a single thought or event. The same observation may be made in musical terms concerning the four short pieces presented here. I. Flute Soliloquy: This opening movement is a brief, free fantasia for a solo flute stop. Three soft and distant chords begin, interrupt and conclude. II. Interlude: This movement begins and ends with flutes in a high register. In the middle, a long-breathed cantilena is played in the organ's lower registers, suggestive of the classical French basse de trompette. III. Reminiscence: After a hesitant beginning, a reposed and reflective aria is heard in the organ's tenor register. IV. Acclamation: The finale is an energetic, march-like rondo with two interrupting couplets. It concludes brilliantly with full organ." James Woodman writes, "Prelude and Passacaglia (In Festo Pentecostes) received its first performance at the 1981 Contemporary Organ Music Festival sponsored by the Boston Chapter of the American Guild of Organists . . . The Prelude is a setting of "Veni Creator" constructed over five complete statements of the passacaglia theme in the bass. The Passacaglia itself then proceeds for fifteen continuous variations during which the wind and fire imagery of Pentecost is made vivid to the ear.